A potential security concern has been identified. content provides critical functionality and you trust its source. This file might contain unsafe content that could harm your computer. 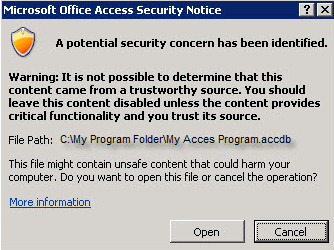 Do you want to open this file or cancel the operation? If packaging up an access solution, then place the registry keys in the Package solution wizard.